Modified Budget Trail 1 (Recycled Plastic) & Gym Equipment - with Grass Mats Surfacing. 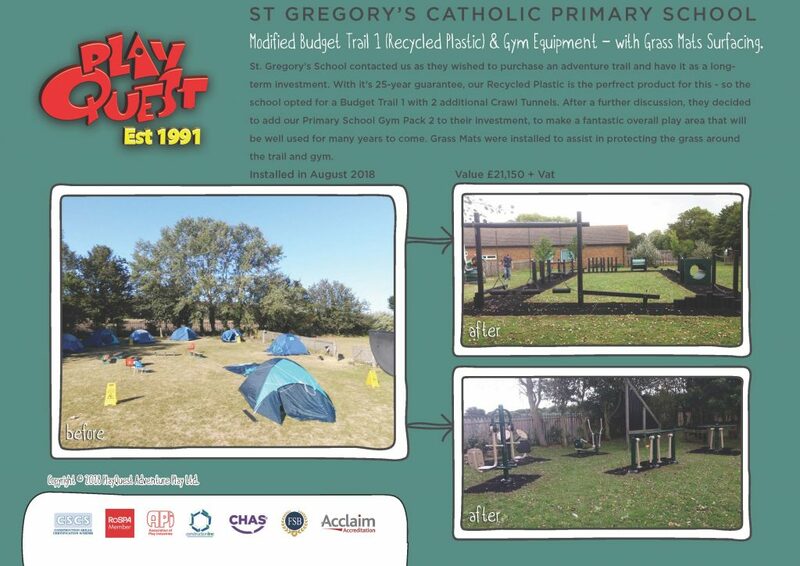 St. Gregory’s School contacted us as they wished to purchase an adventure trail and have it as a long-term investment. With it’s 25-year guarantee, our Recycled Plastic is the perfrect product for this – so the school opted for a Budget Trail 1 with 2 additional Crawl Tunnels. After a further discussion, they decided to add our Primary School Gym Pack 2 to their investment, to make a fantastic overall play area that will be well used for many years to come. Grass Mats were installed to assist in protecting the grass around the trail and gym.